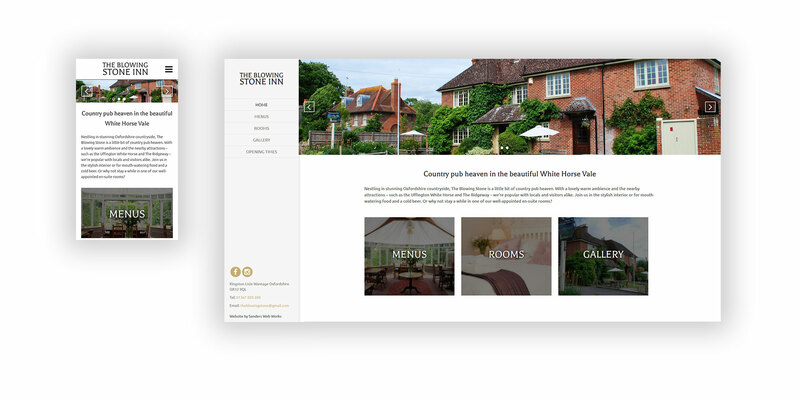 The Blowing Stone is an attractive and well-appointed pub in Wantage, Oxfordshire. It offers well-furnished accommodation, tasty food and a welcoming atmosphere. Sanders Web Works managed the business’s previous website. As part of a re-brand for The Blowing Stone, the new managers commissioned a brand new site, and we’re delighted to have delivered a complete redesign — one that we believe does justice to this lovely traditional pub. The owners provided high-quality images that showcase the establishment’s charm and comfort. We have made the most of these in the design, from the slider on the home page to the gallery of images. We also reduced any visual clutter that might distract from these, framing them with a simple white background. We provided content emphasising the pub’s selling points, but kept this ultra-concise to fit in with the overall theme. At a technical level, the site is built with a CMS system that will facilitate any future updates that need to be made.